This article is about the level in Super Mario World. For the mission in Super Mario Galaxy, see The Underground Ghost Ship. The Sunken Ghost Ship, also known as the Mysterious Sunken Ship, is a location in Super Mario World that serves as a gate to the Valley of Bowser. After defeating Wendy O. Koopa, Mario has to swim through this haunted ship in order to make the doorway to World 7 come out of the sea. According to the Game Boy Advance remake, this level is in fact the first level of World 7. On board the ship are some Bullet Bills, Mines, Koopas, and a massive Disappearing Boo Buddy swarm, marking the only appearance of Boos outside of Ghost Houses in the game, and thus, the only time Yoshi can be seen with ghosts in the game. This is also the only level in Super Mario World that has a Magic Ball. The Super Mario World manual mentions that the Sunken Ghost Ship was once one of the Airships utilized by the Koopalings in Super Mario Bros. 3. This could solve why this level has a Magic Ball, although in Super Mario Bros. 3, they were found in Fortresses, not Airships. In addition, its front does not match that of any Koopaling's airship. The player comes out of a Warp Pipe underwater next to the sunken ship. There is a ? Block and Bill Blasters nearby. 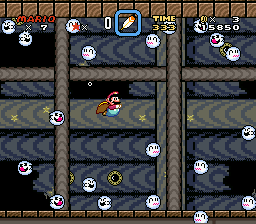 The player must then go down another Warp Pipe that leads under the deck, where Eeries and a massive Disappearing Boo Buddy swarm can be found, appearing and disappearing in locations at a constant pattern. After passing these, there are Circling Boo Buddies and two more Boo Buddies. Then there is another Warp Pipe that leads to a huge drop. When the player starts falling, there is a Super Star that can be grabbed. On the way down there are Dragon Coins, falling Koopa Troopas and Winged Koopa Troopas. There is a platform halfway down with a ? Block that contains another Super Star. Farther down there are huge bunches of coins and falling Floating Mines. The player must fall to the right to avoid falling into the water with the Mines, though if they do, they can collect a few 1-Up Mushrooms near the bottom before they fall off the screen. There is a platform on the right with the green Magic Ball that must be touched to beat the level. After Mario beats the level, a giant cave entrance that looks like Bowser's head will rise up out of the water. Mario will enter the cave which leads to the Valley of Bowser. Although the Dragon Coins in this level are rather difficult to obtain due to the speed of falling, Mario as Caped Mario can easily drift down the level and get the Dragon Coins; being Caped Mario on Yoshi can allow the player to Spin Jump off Yoshi into missed Dragon Coins. The level Haunted Shipwreck from New Super Mario Bros. U bears a lot of similarities with this level. This is the only ghost house-type level that Yoshi can enter. ↑ Super Mario World English instruction booklet, page 20. This page was last edited on April 5, 2019, at 23:27.